To some, it might sound absurd. The truth, however, is that every month thousands of people buy cars online. Physical dealerships are finding it harder and harder to keep up with the competition of the online sales. Especially now. eBay Motors has never looked so organized and full of offers. You can literally build up your search like a lego house. Year, make, model. You can even search by the type of interior you want – colors, fabrics. You can get anything from classics to brand new luxury vehicles. Even a motorcycle or a boat! If you have considered buying a car on eBay, know that the actual purchase is only your first step. Yes, the most exciting one but still only the first. Once you buy the car, what do you do next? Online shopping is not an issue anymore, but bringing that new vehicle you bought on eBay home might seem like a big problem. Should you go and pick it up personally? Fly over or have someone else drive your newly bought car? Or can you ship it? Each of the options carries its benefits, so think carefully before making a commitment. Shipping is the option that provides the highest security to your vehicle and requires the least engagement from you. With shipping, there is no need to take time off of work to travel. And you will not have to occupy any of your friends either or lose sleep over letting someone else drive your car. The best benefit of it all is that you get convenient delivery of your car straight to your garage door. But how do you do this exactly? 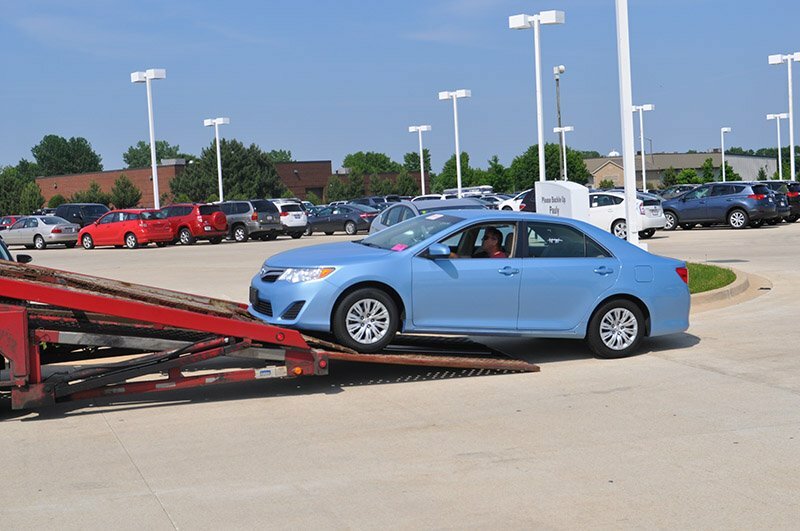 If this is your first time shipping a car, the process might seem scary. Just like anything new and unknown, shipping a car could be a burden if you don’t go about it the right way. Therefore, it is crucial for you to choose the right partner in this little adventure. After all, you just bought a car on eBay! You don’t need more stress than that. You should start looking for an auto shipping company at least a couple of weeks before the date you want your vehicle delivered. It will give you enough time to compare and evaluate all options and schedule the shipment. A key point to remember during your research: price is not the most important factor. It can vary daily based on the supply and demand in the particular time period. So what someone tells you to be a high price today might be the lowest tomorrow. Cost also depends on the route and the type of transport you select for your car. The best way to go about this is to ask for a shipping quote online or by phone. Instant quotes can be helpful if you ship your vehicle on a well-traveled route. Still, companies that provide manual price quotes can give the most accurate and honest price that will ship your car in a timely and professional manner. If you have an eBay account, you have the choice for shipping cars bought online, regardless of whether the car was bought on eBay or elsewhere. Certain auto transport companies and dealers actually offer their services for purchase through eBay. Once you sign in to your eBay account, search for “auto transport” in the main search bar. From there, you will get a list of options with different transport agencies located across the country. The market of auto shipping companies is getting more and more saturated, and you can easily get tricked if you don’t know the process. Few big companies dominate the market; there are plenty of smaller ones, too. If you are new to this, how would you choose the right partner? Smaller, family-owned auto transport companies provide more flexibility. You can talk to a representative of the company personally, and you will always know who is taking care of your car. Bigger companies might be able to provide you with better prices. Yet, a car is a big purchase. It’s not a new tie or a dress after all. You need to feel safe about your purchase throughout the whole time. Some sellers on eBay already include shipping with their purchase. They provide estimates of shipping costs based on arrangements with certain shipping companies that offer their services on eBay. The prices will obviously vary from car to car and dealer to dealer. This means you will need to pay attention to the listings page on any vehicle you consider purchasing from eBay. So before you commit to a shipping company, research their policies. Call them to get more details about the procedure. Test their transparency, and when you are certain there is nothing in the small print you don’t understand or agree with, go for it. A car is a risky purchase. Anything you buy online is a risky purchase. A car you bought online is… You can finish this one; you get the point. eBay is an established website, but just like any other e-commerce site, it carries a sense of insecurity. Check on the type of insurance the shipper carries. The insurance coverage may vary from one company to another so if you are really particular about the extent of the coverage they offer, you can either ask the shipping company or the insurance company. Typically, auto transporters purchase $250,000 coverage, which comes down to about $25,000 per car. The liability insurance also depends on the type of transport. At Corsia Logistics, all open car carriers usually carry a liability of $250,000. Many enclosed trailers carry insurance of $500,000 and can go up to $2 million if the customer prefers. If the car you are transporting is very valuable, either price-wise or in terms of sentimental value, you can request for additional coverage subject to additional payments from you. Once you select a shipping company, check how credible they really are. Today, almost everything happens online, so you see very little of the whole process. Hence, it’s necessary to double-check before you put your newly purchased car in someone’s hands. Consult the FMCSA for transporter’s USDOT numbers, safety ratings and license and insurance information. An auto moving company not listed with the Department of Transportation can mean one thing: it is not legally authorized to do business as a motor vehicle carrier. Before your final commitment, make sure you have the transport shipping details in writing. Read the contract fully. It might not be a one-pager, but it is in your best interest to spend some time to get the details right. If you are not sure about something – call, ask, confirm. It is always helpful to look for customers’ reviews and opinions about the company. Prior experience can help you set your expectations right. Pay attention to the way the company handled a specific situation. And most importantly – look for the human attitude. You need a company that is reliable and treats you like a person, and not another dollar in the bucket. Your new car is one step closer! Yay! You did the bigger part of the job already but don’t get sloppy at the end. Here are a few tips to guide you in the final steps. Shipping a car you bought on eBay is a breeze, when you select a partner like Corsia Logistics! Once you choose an auto shipping company, schedule the shipment. Discuss this with the eBay seller, too. You need to find the right time for them but also to match it with the best option the shipping company offers you. Remember that location is key. The place where the car needs to be picked up and the ultimate destination are of key importance to getting the best deal on shipping. The more common routes are cheaper. Maybe you can plan on getting the car shipped to a bigger city near you and then picking it up yourself. Do the math and arrange the shipment accordingly. When you get the car delivered, you need to carefully check your ride for any damages. It is critical to know the exact condition of the vehicle you have purchased. You can ask the eBay seller to provide detailed photos of any peculiarities of the car. Even a video. This way you will have documented the condition of the car before the shipment. You can easily compare with the condition at the delivery, and you will have proof in case something has gone wrong during the shipping process. Auto transport companies are very careful about these last stages, too. At pick-up, the carrier will inspect the vehicle and mark any pre-existing outer damages on the Bill of Lading. This is a must do. If the car has a pre-purchase inspection report, the eBay seller you are buying it from should give it to the carrier to add to the carrier inspection report. This is all for your own peace of mind and the vehicle’s safe condition. Once you receive your new eBay purchase, don’t forget to leave a review. For both, your seller and your shipping company. After all, there are thousands of other crazy people like you who are about to buy a car on eBay.